THE CENTRAL KALAHARI GAME RESERVE (CKGR) was established in 1961 by the British colonial powers as a sanctuary for the San, a place where they could practise their traditional hunter/gatherer lifestyle. More than 20 years later, it opened its gates to visitors; today, it’s a prime tourist destination in Botswana. 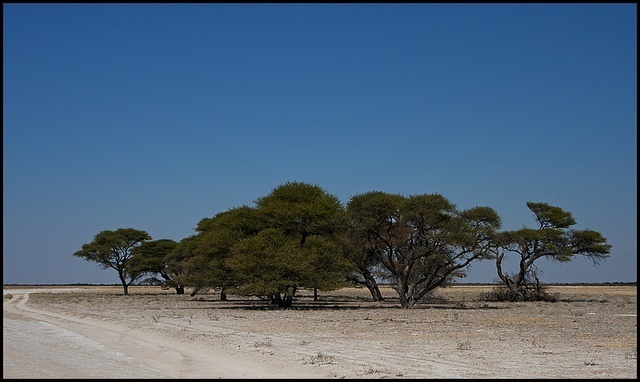 , this park takes up 9% of Botswana’s surface area and forms part of the Kalahari Basin. private roads leading to the mine. also be accessed via the Khutse entrance gate. Gemsbok. Springbok. Lion. Cheetah and Leopard. Bigfoot Safaris operate the majority of the park’s campsites with the remainder run by Botswana’s Department of Wildlife and National Parks (DWNP). A number of upmarket lodges are also found in the park. Accommodation reservations and pre-payments are essential, but park entry fees can be paid at the gate on arrival (in cash, Botswana Pula only). Visitors must pay a Park Entry fee and Vehicle entry fee and campsites must be booked in advance. A good off-road vehicle is required to travel the two-spoor tracks in the CKGR. It’s impossible to travel from the northern region of the park to Khutse Game Reserve in the south, in a single day. The region is vast, roads are either muddy in the rainy season, or very sandy in the dry season, which makes for slow progress. Driving at night is strictly prohibited so overnighting at either Xade, Xaxa or Bape campsites en-route is required. If you arrive at a park entrance gate just before closing time, you won’t be allowed to enter and make the long trip to your campsite. You will be forced to spend the night at the park entrance gate. If travelling here during December, sand will not be a problem for a vehicle like a Toyota Prado or similar, just deflate your tyres to approx 1.8 bar if loaded. Rain could be a problem during December though - there will be mud, so take care when you pass close to pans or have to cross them. Take appropriate recovery equipment in case. Travellers have reported deflating to 1.6 bar in April during the drier season. Reportedly a traveller went here in April 2013, without any driving problems due to water or rain, as most of the water was absorbed by then. But take note that weather is very unpredictable now, and Botswana is now a more 'wet' country than it was 20 years ago. Often in the rainy season you might encounter a muddy patch or so, but no deep water crossings, bottomless bogs etc. - only surface mud in the CKGR. At the very worst you might get stuck for a while until you get extricated by a passing vehicle or manage yourself, but getting stuck is highly unlikely if you drive sensibly. Travellers have travelled the CKGR in January after days of torrential rain deep into an already very wet rainy season and had no hassles. (Mar-14). No petrol, diesel or food supplies available in the reserve. Camps in the park aren’t fenced so it’s possible (and common) for predators and other game to enter the campsites. Look around for dangerous game before exiting your vehicle, and stay close to your campsite at all times if on foot. Unguided walks in the park are prohibited as these could have disastrous consequences should you encounter dangerous game. If predators enter your campsite at night, stay in your tent or vehicle, and enjoy this incredible experience until they leave. Don’t attempt to chase them away, as this may result in an attack (fight) rather than flight. Pack away all food at night, as this may attract scavengers such as hyena. As there are no facilities, it’s recommended that inexperienced travellers visit the park in the company of a guide, or someone who’s an experienced overland traveller. Stay on the tracks at all times - driving off into the open veld is strictly prohibited. There’s no water inside the park and visitors must be totally self-sufficient when staying here due to the absence of facilities. Most campsites consist simply of a wooden shelter with concrete floor, bucket shower, and a surprisingly ‘unsmelly’ long drop chemical toilet. There’s no running water. Depending on the rainfall, borehole water may be available at the various entrance gates, but this isn’t guaranteed. Firewood may not be collected in the park so stock up en-route. Visitors are requested to consider the environment, and limit the fires to cooking and small fires to socialize around. Avoid huge bonfires which burn unnecessary wood and run the risk of starting veld fires. Driving from Xade to Piper Pan took a traveller about 6 hours in April 2010, as it was pouring with rain. The track can then get extremely muddy, and where there is no mud, it will be covered in water. In the dry season it can take anywhere between 3 and 6 hours as it's a very bumpy and rough track. Visitors to the area must be self-contained as the park is very undeveloped. You are no longer allowed to collect wood from the bush in the CKGR, bring your own firewood! If you want to pay your park entry fees upon arrival at the park, you must have the correct amount in hand in Botswana Pula; there are no credit card facilities at the entrance gates and change for large denominations may not be available. You can pay your park entry fees in advance with a credit card at the DWNP reservations office in Gaborone. Be sure to stock up on fuel and produce in either Maun, Ghanzi, Gaborone or Serowe - there’s limited shopping opportunities in the smaller towns en-route to the park. Plan your trip with the aid of Tracks4Africa map products, these reflect actual travel times between camps.